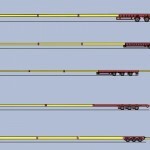 Here comes my collection of AutoTURN Nooteboom trucks for wind blades transport. I’ve created them starting from several drawings, technical documentation and brochures I’ve found trough the years for the Teletrailer and Telestep. Of course I can’t guarantee they are correct, but until now they have worked – no truck has been stuck in a bend. The main problem you will see if you work with AutoTURN is that you can’t use the reverse direction with this type of vehicle, although in real world situation we use it quite often: for this reason when I need to simulate it I use a standard truck, only “stretched” to the length of a Teletrailer. The V100 is available in 2 version, with vertical and horizontal (that is, lying) blade as I’ve seen it transported in both ways. 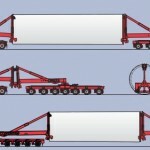 Royal Nooteboom Trailers is a Dutch company dedicated to special transport: flatbed trailers, low loaders and other amazing wind related vehicles. They have developed several solutions for the transport of nacelles, tower sections and blades. 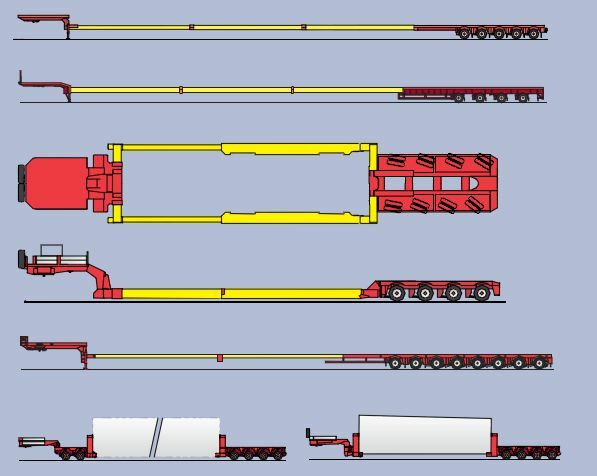 Among their products, the MEGA wind mill transporter (for towers and nacelles) and the several families of blades trailers. 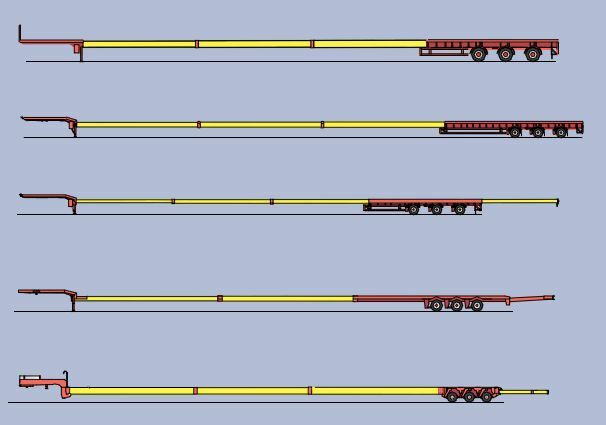 Special tailored solutions can be developed for transport of blades over 50 meters. They allow remote controlled, independent rear wheels steering, a really useful functionality to choose the best trajectory in complicated environments. One of they last invention is the Tele-Step, specially designed for very long blades (50+ meters), with a peculiar turn table mechanism below the blade that permits movements otherwise impossible. 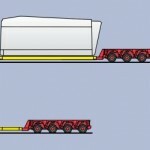 Another interesting product, the MEGA wind mill transporter, can load and unload the tower or nacelle without the help of a crane. It consists of 2 hydraulically adjustable lift-adapters that can be universally employed on various vehicle types. 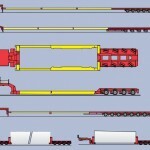 The lift-adapters are connected to the semi-trailers by means of a turntable, and the load can be rotated up to 80 degrees. The outstanding maneuverability is due to the fact that the swept path covered is determined by the size of the load only and not by the steering behavior of the vehicle. Pretty amazing. It’s not easy to find technical drawings of their products online, so I’ve decided to share with the rest of the world several PDF / DWG from my private collection.